With two layers each of a creamy pudding mixture, graham cracker crumbs and sliced bananas, this 5-minute, no-bake recipe will be your new go-to dessert. Pour milk into large bowl. Add dry pudding mix. Beat with wire whisk 2 min. or until well blended. Gently stir in the whipped topping. Let stand 5 min. 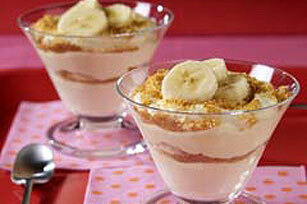 Layer half each of the pudding mixture, graham crumbs and bananas in four individual dessert dishes; repeat all layers. Refrigerate at least 1 hour or until ready to serve. Store leftover desserts in refrigerator. Prepare as directed, using JELL-O Chocolate Flavor Sugar Free Fat Free Instant Pudding.